Renee was pleased for her mother and grateful for their improved mother-daughter relationship. Gunder was a lovely man. Renee had liked him immediately. He was proud of his farm and delighted to be sharing it with Monique. Renee's mother had told her much about him, but last night as they sat outdoors enjoying the unusual twilight glow of Norway's summer evenings, Gunder had filled in many of the details. He had been widowed young and with no children, had lived a rather lonely life. As the second born son he had chosen the life of a sea captain instead of that of a farmer, the family farm having been left to his older brother as was Norwegian custom. A few years ago, however, Gunder learned that the farm was no longer owned by a family member but had been sold to someone outside of the family. Gunder, recently retired from his life at sea, decided to buy it back. Under the Norwegian legal system, the Odel law allows a family member to re-claim a family farm after it has gone out of the family. Historically, the Odelslov prevented the monopolization of fertile lands by wealthy developers and thus preserved individual farms and building traditions. A typical Norwegian farm had several buildings designed for a variety of uses. 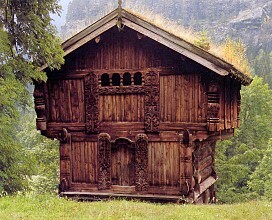 The stabbur, however, was usually the most picturesque of all buildings and was almost always a fixture on every Norwegian farm. It was a granary and storehouse. If it had two stories, the lower floor was used for grain storage and the upper floor held furniture, clothing or anything the farmer owned that he considered valuable. The stabbur was also the most ornate building on the farm. It's architecture remained basically the same for centuries. The heavy corner logs were turned and the upright staves were often elaborately carved. The roof was usually sod, but could also be stone or shingles. The more prosperous a farmer was, the more elaborate the stabbur was. By the middle of the 20th century most of these wonderful buildings were no longer needed for their original purpose and most were put to other uses. Some were preserved for historical reasons, but many have been remodeled as guest or summer cottages. There were two stabburs on Gunder's farm and at the time he met Monique, he was in the process of redoing the interiors to use them as guest cabins. As Renee looked about the upper room of the stabbur she and Philippe were sharing, she smiled remembering what Gunner had said about its furnishings. 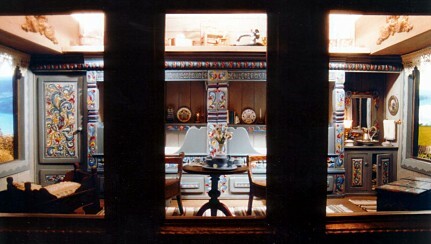 The twin alcove box beds were, of course, the centerpiece. Gunder had found them and many other pieces of furniture stored in the 2 stabburs. The previous owner had remodeled the large farmhouse and removed most of the furniture including the built-in beds. He must have recognized that the beds had historical value, so kept them in storage.